Ashley Knight started his career aged four in his parents' variety act. His father was a stand-up comedian and his mother a fire-eater! As a child in the 60s he was seen in dozens of television commercials and played Terry Scott's 'Bruver' in a series of ads for Curlywurly. As a young actor in the 1970s and 80s he worked almost continually, with feature and leading roles in film, television dramas and television series including: Warlords of Atlantis, SWALK, Circus, Softly Softly, Chester Mystery Plays, Much Ado About Nothing, The Swish of the Curtain, Hale and Pace, and most notably as Young Claudius in I, Claudius, Jim Hawkins in Treasure Island and Ken (the inventor of) Metal Mickey, the three-year cult 80s series for LWT (just released on DVD)! Throughout the 80s and 90s roles in theatre productions and tours included: Eugene in Grease, Brad in The Rocky Horror Show, Benjamin in Joseph and the Amazing Technicolor Dreamcoat, Noël Coward in Cowardy Custard, Michael in Matilda, Charlie Chaplin in Bertie, Cookie in Return to the Forbidden Planet, Godspell and numerous pantomimes. West End productions include: Frontiers of Farce (Old Vic), title role in Bar Mitzvah Boy (Her Majesty's), George Strunk in Grand Hotel (Dominion), himself in Whoop De Do (King's Head), Sipos cover in She Loves Me (Savoy). 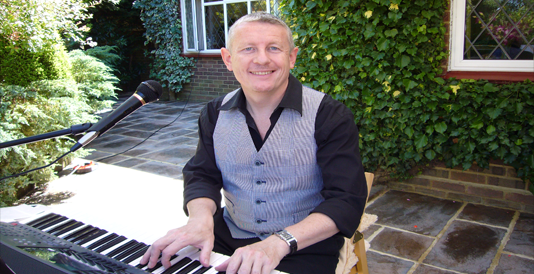 Between engagements he had taught himself piano by ear, and from 1997 to the present he has worked as a jazz and cabaret piano/vocalist worldwide on many luxury cruise lines and in most of London's prestigious hotels and nightspots. 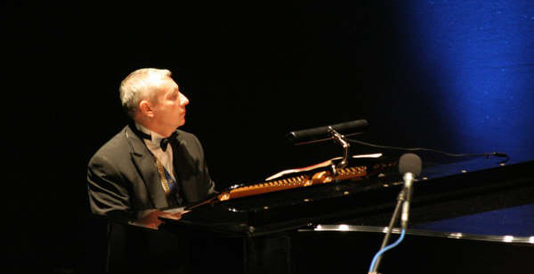 In 2002 he played at Sir Elton John's Windsor home for the star's celebrity-packed White Tie and Tiara Ball. He returned to the stage in 2006 as Sipos in She Loves Me and Christmas 2007 at Camberley Theatre played Baron Hardup in Cinderella. Ashley spent 2008-2010 on tour playing "Cogsworth" In Disneys "Beauty and the Beast" for UK Productions and has recently performed at The Barons Court Theatre as Larry in Steven Sondheims "Company" to celebrate the the Composers 80th Birthday.